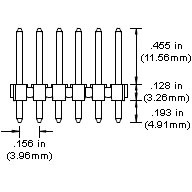 Header pin connector, 0.156-inch spacing. Break-away style- can be easily cut-down to smaller size if needed. Pin Length: See image below for specs. Some applications may require a longer or shorter pin- check your application before ordering. Different Sizes: Most header strips can be easily cut shorter (especially break away headers) if you need a shorter strip, as required (such as an 4-pin, or 5-pin placement, etc.) 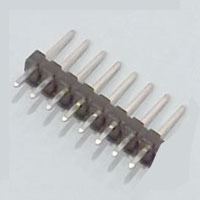 Combine header strips on PC board to make longer connectors- such as two 10-pin headers to make a 20-pin header.